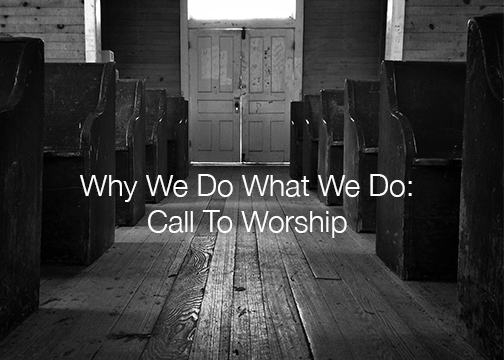 Why do a “Call to Worship”? People come into church on Sunday with the weight of the world on their shoulders. They may have gotten in a fight with their spouse, lost a job, or received shocking medical test results. In all of this, God’s word offers respite from the stresses, pressures, and distractions of world. People hear the word of God and are comforted that God is a firm foundation in very shaky times. Also, we have a tendency to focus inward toward our selfish desires. By engaging in a Call to Worship we are broken out of this mindset and drawn to our sovereign God. He uses His word to shift our focus from ourselves to Him and His will. It’s a beautifully necessary thing to participate in. Why use Scripture as a “Call to Worship”? Scripture is God’s word. By using His Word to call us, we are reminded that it is God who initiates the invitation. It’s His Word that works faith in our hearts through the power of His Holy Spirit. Scripture also gives us a reason for responding to His action. Singing, praying, giving, listening, and building each other up are all responses to God’s undeserved, unidirectional, and all-encompassing love. When we are reminded of who our God is and what He has done, our response is worship. Psalm 100:4-5 is a great example of a Call to Worship. Note : This would generally be used at the beginning of the first song. The band begins to swell in lightly under the Worship Leader as the congregation is encouraged to engage in this call and response. By reading this together as the gathered church, people are reminded of God’s good character and His endless love. This elicits a response of praise and thanksgiving. Most of the time we will underscore a Call to Worship so that it feels like it is part of the first song. This usually is a song that emphasizes God’s initiating action, His Character, and our response.